This is my first post dedicated to scripting. I´m creating on my spare time an auto-rig tool for Autodesk Maya and I already have some stuff coded, but I decided to share some of the functions with you, and create a tool that could help you and speed up your rigging tasks. This first version of the kit, will allow you to create FK chains, IK chains with the up-vector, and a basic spherical control. I will create more posts with updated versions of this tool kit, implementing new features on it. Please feel free to contact me and tell me if you are using it, so maybe we could share more stuff. 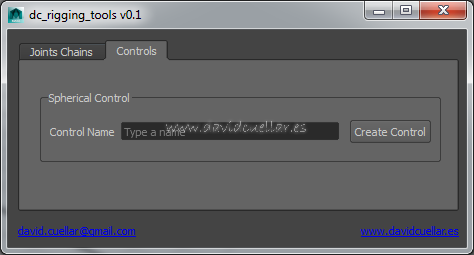 This tool has been created and tested only under Windows at this actual moment, and only on Autodesk Maya 2014. Probably will work on previous versions. If you are using this tool on previous versions, please let me know if it is working. For use this tool, you should have installed PyQt4 and running on Autodesk Maya. Copy the PyQt4 folder, and the sip.pyd file from your python26/lib/site-packages directory into the Maya install / python/lib/site-packages directory. Copy and run this code on a Python tab on the script editor. The user can create several Fk chains. The joints will be align and the rotation zero out. Spherical controls will be created to control the joint chain. The first step is to give a name for the chain and select the number of joints that the chain will have. Select the number of joints (1-99), and place the locators where he wants. The last step is just click on create it. The user can create several basic IK chains. Click on Create Temporal Locators, and place the locators where you want. Please contact me for suggestions. Thanks for reading and see you on next updates.